When a flood strikes your home or premises, the immediate effects can be devastating but eventually all floods subside. However, floods invariably leave behind wet sticky soils and sludge, and sodden carpets and upholstery. Less dramatic, but equally important to deal with, are the small floods, for example, a burst water pipe, a leaking radiator or a bath overflowing. If you have ever experienced a flood in your home or business, you’ll know the importance of fast action. A quick response is critical to minimize water damage to your property and contents. To properly dry the carpet, under felt, contents and the structure, requires highly specialized equipment and the training and skills to use it. Cleaning Doctor Disaster Restoration uses the latest and best in drying technology, specialist heating and drying equipment and dehumidifiers, to remove the remaining moisture. The key to rapid, successful drying is heat and airflow, which is applied directly to the wet materials or to the internal structure of the building. This procedure dramatically increases evaporation. Cleaning Doctor is able to dry your flooded home or business faster than other methods used by other companies. This part of the operation can take a number of days. Cleaning Doctor monitors the progress of the drying process until your property is fully dry and restored. Drying with heat has another great benefit; it prevents and impedes mould spores. Cleaning Doctor drying generates enough heat to effectively prevent mould and bacteria growth in certain situations. Using state-of-the-art equipment and techniques, Cleaning Doctor Disaster Restoration can remove excess water and set up a drying system to have your home dry in as little as five days! As a fully certified restoration company, we are trained and experienced to handle any size job from start to finish. We will continually monitor the drying process from start to finish; we’ll take the necessary and regular moisture readings that will be required by your insurance company. We will work with your insurance company to put your life back to normal in the prompt and professional manner. 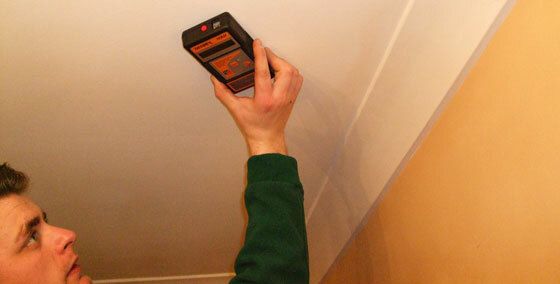 Taking regular moisture readings is an important part of the restoration process. Call Cleaning Doctor's Martin & Tricia Bailey Today! 100% Satisfaction Money Back Guarantee! Cleaning Doctor Carpet & Upholstery Services South Devon is a Cleaning Doctor franchise independently owned and operated under licence by Martin Bailey and Patricia Bailey.